If you are a power tool woodworker interested in taking your woodworking to a new level, then this collection of articles, pulled from the covers of Popular Woodworking Magazine, is a great place to start. Chris Schwarz sets the pace for the rest of the collection in the first of seven chapters, with three introductory articles discussing the reasons for, providing the motivations to, and outlining the fiscal ease in which you can incorporate hand tools into a power tool shop. Since most hand tools do not work well when dull, the second chapter is comprised of nine articles dedicated to helping you make your tools sharp. These articles focus on sharpening plane irons, chisels, scrapers, and draw knives and also cover some of the different sharpening techniques, like using the ruler trick or adding a camber to your plane blades. Chapter 3 covers hand planes and is the subject with the most articles dedicated to it. There, you will find information on what different kinds of planes there are and when to use each one, how to restore a flea market find and how to tune a new one, and on using wooden planes, smoothing planes, and jack planes. The last article is a bit of eye candy, with some great photos and information on infill planes. The next two chapters discuss the use of hand saws and chisels. In the chapter on saws, Frank Klausz gives us the final word on dovetails and Chris Schwarz discusses East vs. West. Another article goes into detail on the usefulness of the bench hook and how to make one. The chapter on chisels covers basic and advanced chisel techniques, restoring an old chisel, and modifying stock chisels to work better. Do you know how to properly use an awl? Or what the difference is between a striking knife and a marking knife? Or how to glue up a table base without using clamps (I’ll give you a hint – it involves drawboring)? These answers and more can be found in Chapter 6, which contains several articles on the other hand tools you might want in your shop. The final chapter provides you with the perfect excuse for buying some hand tools – projects! Start off your bench obsession with the Roubo-style workbench. Then follow it up with a cabinet to store your planes, a sawbench for sawing boards using the proper form, and some miter shooting boards for making tight, precise joinery. The articles are all well-written with crisp clean photos and clear captions. They are both concise and detailed and easily read one at a time or all in one sitting. 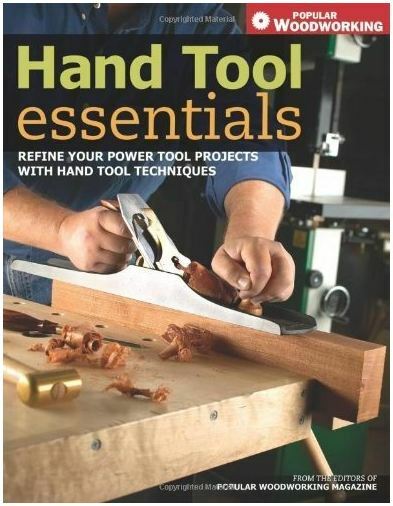 Had I not won this book for planing the flattest board at a Chris Schwarz hand plane class earlier this year (err… 2009), I wouldn’t hesitate to spend the retail price of $24.99 to add it to my permanent collection. Over the next few days, I’ll be copying over book reviews from my old blog onto this one. You’ll notice they’re all fairly short – around 600 words or less. That is because I write book reviews for the monthly St. Louis Woodworkers Guild newsletter and I have word space limitations to follow. I don’t mind, though. It is a good exercise in self-editing. Anyway, I thought it would be good information to bring over. I can keep it organized better in this blog, in any case. I probably won’t copy any old entries over other than the book reviews, though I might rehash a topic or two that seemed to be popular (fuming oak was a good one). I’ve looked at this book several times but have never purchased it. I think it is the part in the title that speaks of power tools that pushes me away. Thanks for the review; you’ve made me rethink my bias about it. I also have this book, and i always find myself going back to it. You can probably get everything off the Popular Woodworking Magazine website, but it’s nice to have their selection all in one place. Plus it’s nice to support them!